Larne and its surrounding area is one of the earliest inhabited regions in Ireland and its early history was marked by a series of conflicts including invasions by the Vikings and the Scots and the 1641 Rebellion. However, the town's fortunes improved with the arrival of the Industrial Revolution and from the mid-nineteenth century the harbour became a lynchpin of the local economy as a source of tourism and trade. This history of the town contains over 50 photographs from the early years of the twentieth century, a time when the town still basked in this economic boom. 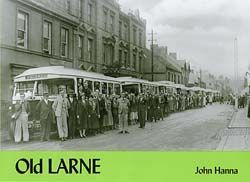 Many of Larne's expansive hotels are shown, as well as subjects such as the railway station, the steamers that plied their trade at the harbour, local streets and schools, the long-gone swimming stages at the Banks, and the nearby villages of Inver and Glenoe.